100% chevalier is a French math rock trio with a strong emphasis on funk and the danceability of their music. Perhaps straightforward at first glance, EP-ÉE is actually filled with polymetres and groove. Despite being released in 2015, the EP feels fresh in today’s math rock scene, and we’re looking forward to the band’s next endeavour. Modulate is Escher‘s last take on progressive metalcore. The album is rather interesting with its dissonances, its songs’ structures, and its incorporation of jazz. It’s hard to say how much jazz influenced the heavier parts, but the songs often present a softer, jazzier section. 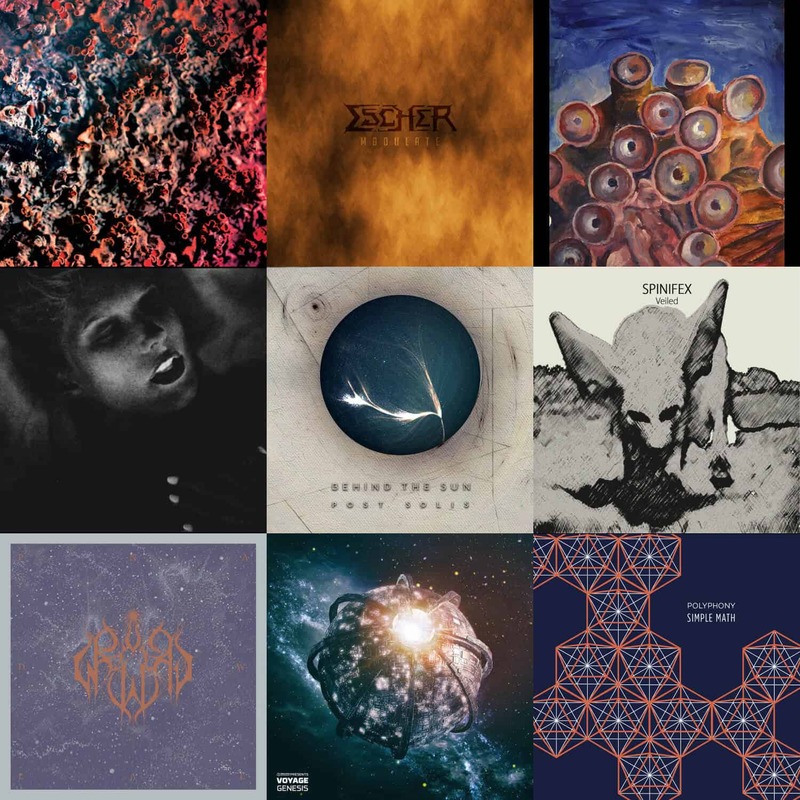 They’re far from being full-on jazz compositions, and feel quite weak, especially when compared to some stuff featured on this website, but their inclusion within progressive metalcore is more than uncommon. And the songs, as wholes, are pretty good! Coalesce is Jessica Ackerley Trio‘s first release, and it’s a great avant-garde jazz album! With both composition and improvisation, the album throws your way challenging pieces between free jazz and avant-garde rock. This, of course, leads to a tremendously appealing record that fascinates and tribulates. Schnellertollermeier‘s X is an amazing and unmissable album by the German trio. Bringing experimental jazz to the borders of avant-garde metal – which they term ‘brutal-jazz’ -, from the twenty-minute journey ‘X’ to the intriguing, two-minute ‘Backyard Lipstick’, the band never ceases to amaze. Yes, it’s two years old, now, but good wine gets better with age. Releasing in March, Post solis is Behind the Sun‘s take on progressive death metal. The EP also puts in some post metal, for good measure. The result is a pretty good if linear thirty minute experience, with a few surprises along the way. If you can digest some less experimental stuff, from time to time, this is a good headbanger. Spinifex is a band that was thrown away in my bandcamp wishlist and unjustly forgotten. I went through it, lately, because of bandcamp’s ACLU donation day, and found Veiled, the band’s only album to date, at least on this website. The experimental jazz quintet from the Netherlands is abrasive and seductive, and they have an outstandingly good ten-track album! Sun Worship is an atmospheric black metal band from Germany, and Pale Dawn was released in May of last year. Droning and mystifying, the album drags you along forty contemplative minutes and manage to entertain you all the way through. It’s a great album! Voyage is a drum and bass artist from the United Kingdom, and Genesis is their only album to my knowledge. At a staggering ninety-four minutes, it’s a bit too massive for its own good, but there’s more than enough worthy material on it to make it listenable – just skip a track here and there and all’s good. As for how it sounds, imagine Venetian Snares’ Detrimentalist, but with less experimentalism, tamer drumbeats, and a penchant for spacegazing. Simple Math is a harsh math rock EP from Polyphony, an experimental math rock quartet from New Jersey. The only four songs on the record are enthralling and challenging. That alone makes for an outstanding EP that deserves some of your time. On	February 5 2017, this entry was posted.